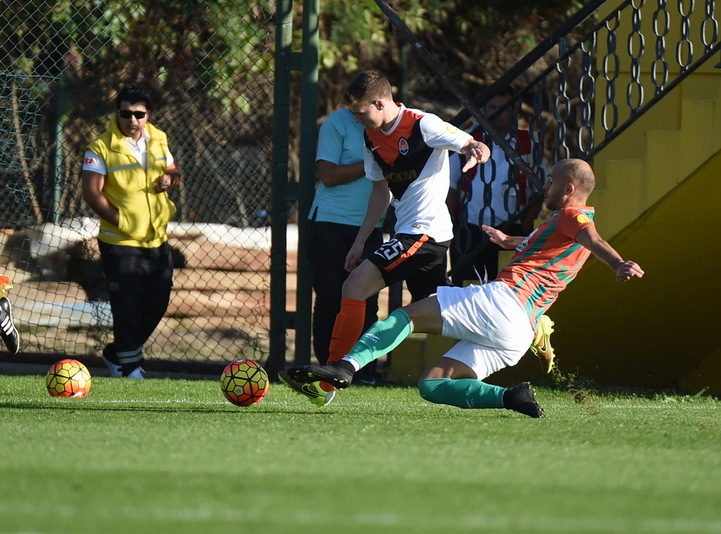 Second game of the Pitmen at the Turkish training camp became the match with Alanyaspor. During the absence of internationals Mircea Lucescu’s team played with almost the same squad as two days earlier with Antalyaspor. The only change took place at left back, where Ismaily was fielded in the starting eleven – Azevedo remained on the subs’ bench. The Pitmen dominated in the opening stages of the game, with energetically going forward and taking a number of dangerous shots: Wellington missed the target from a free kick, and then Bernard fired the ball just over the crossbar following a corner kick. Both Brazilians were very energetic, and on 17 minutes it was them who organized a goal scoring chance: Nem received a pass from Bernard before drilling a cross into the penalty area, and Ferreyra sent the ball in to make it 0-1. Shakhtar forced the Turkish side to defend with eleven players behind. Alanyaspor periodically managed to orchestrate counterattacks and finish them with a shot – in a couple of episodes Kanibolotskyy did not allow the opponents to score. Also, Ferreyra, Kobin, Dentinho and Bernard had opportunities to score before the break but the scoreline remained unchanged. Before the start of the second half Mircea Lucescu made three changes, fielding Kryvtsov, Azevedo and Teixeira instead of Matvienko, Ismaily and Eduardo. The game saw an end-to-end match until Alanyaspor equalized the goal: on 53 minutes, Okan slotted in an Asigil cross. After that, Shakhtar held a few dangerous attacks. The Turkish team coped with them, but on 60 minutes Dentinho was brought down inside the penalty area, and Ferreyra confidently converted a penalty to make it 1-2. It should be noted that in the second half Boryachuk and Gryn were fielded in the second half to get match practice. In the end of the game Kanibolotskyy make wonder saves on a number of times. In turn, the opposition goalkeeper denied Teixeira a chance when the latter bore down on goal and following a shot from Dentinho. The Pitmen claimed a 2-1 win thanks to a brace from Facundo Ferreyra.